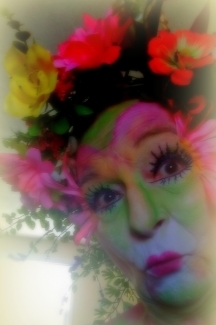 Let's give a big welcome to Posie the Flower Pixie! She's my festival alter ego who loves to interact with the younger folks. I've written lots of music for her to share so keep a watch out for a NEW ALBUM called "Wee Folk Stomp" and an ultra cool lyrics book done as a coloring book! I'll be going into the studio soon to record it and the book is in process, too! She is bright, loud and loves to instigate things like parades and spontaneous fun! She also love to make Tutus... you know... those pretty dress things that ballerinas wear? She makes them in her garden so you can find lots of hidden flowers in her tutus! AND now she has her very own Facebook page! Give her a Like at https://www.facebook.com/PixieSong/" target="_blank">http://https://www.facebook.com/PixieSong/ Watch for her performing and making mischief at festivals this summer! First stop for Posie is the Beltaine Celebration at Our Haven in French Lick, Indiana. Check the calendar - that will be on April 26-29, 2018! She is bringing two beautiful Flower Tutus for the Auction that will be held on Saturday! Come on out and place your bid! ±» µ ± AC DC, µ° »µ·°° ±»° AC Milan ·°° ·µ· ° ±»° ±» °°° CS, ±»° µ 1 ± ± ACDC, , °µ ±» » °¶ Counter Strike, µµµ ±» ° AC DC. - ·µ· ° ±»° »± ACDC ±»° °µ ¶µ AC DC.